On February 10th, I went to the Mills 50 District to sketch the Dragon Parade Lunar New Year Festival. The Lunar New Year is the most important festival celebrated in Asia. In countries such as Australia, Canada and the United States, although Chinese New Year is not an official holiday, many Asian organizations hold large celebrations and parades to share the culture. I parked on a suburban street behind Sam Flax and walked towards the sound of firecrackers exploding. A woman gardening in her front yard looked down the street to see what the ruckus was about. In a parking lot behind a Chinese restaurant a crowd was gathered to participate in the parade. 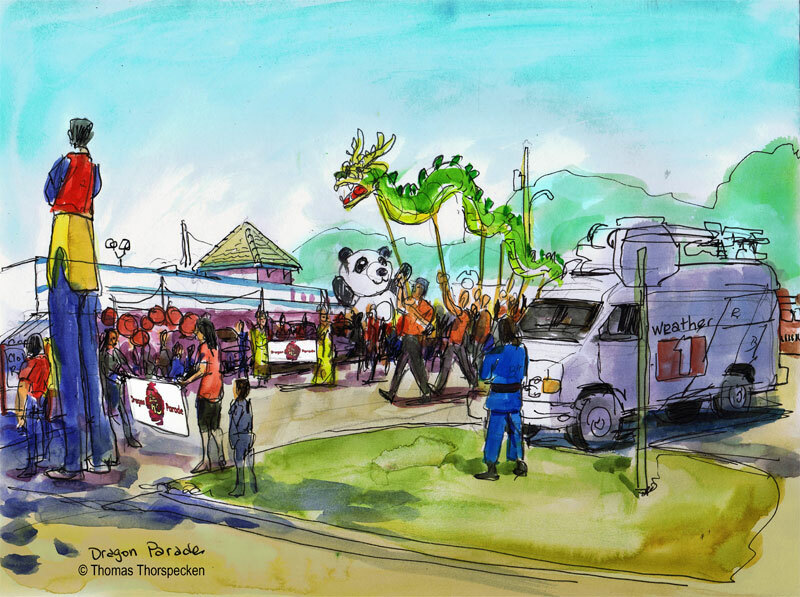 There were martial arts groups, Taiko Dojo Dancers, girls Demonstrating Chinese YoYos and a long dragon boat. The second I sat down to start sketching, the parade started moving onto the street. I panicked sketching as fast as I could. I was still sketching long after the last parade participants had left. The dragon itself was animated by a crew of puppeteers who each held a stick that was attached to a section of the dragon. As they waved the sticks left and right, the dragon slithered in a sinuous dance down the street. introspective, and refined. Ancient Chinese wisdom says a Snake in the house is a good omen because it means that your family will not starve. People born in the Year of the Snake are keen and cunning, quite intelligent and wise. They are great mediators and good at doing business. Therefore, you should have good luck if you were born in the Year of the Snake. When I finished my sketch I went to Sam Flax to get some new brushes. I met former Disney background painter Xinlin Fan. He still lives in Orlando and he teaches painting at Guangzhou University in China part of the year. His English is rusty and broken but it was wonderful to see him. It is great. Thank you for your work. May Asia Trend Magazine feature your piece in the magazine? Do you have any other asia-related sketch? Thank you for your interest in my work. $100 for one time North American reproduction rights.